1963. Shane Malibu #159 9ft 7". FIN: Reverse/Pixie/Phil Fin Green laminated fibreglass 9 1/2inch x 8 1/2 inch base?? Two copper nails have been used to set the fin in position before rovings were added. HISTORY: Purchased at garage sale, Karella NSW 1978, by Grant Lumberg . 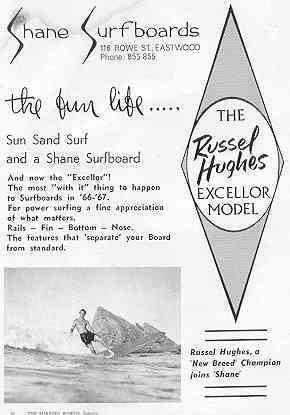 history update ( Mick Mock) is that the board was shaped by Floyd Smith during a visit to Australia. I hope you might consider updating the history on the board. original reverse dorsal fibreglass fin, I bought it from the original owner in 1978 for $50. Would you like to add this board to the register or is it too similar ? COMMENTS: Board in original condition except for two minor repairs. Photographs DV8s Old Mal Rally, April 2001. Thanks to Grant Lunberg.